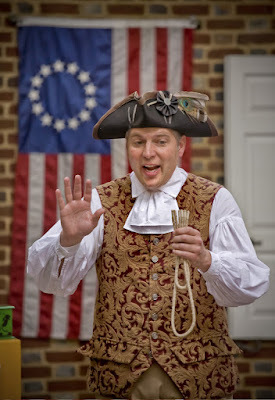 Market & Muster Day at Washington Crossing Historic Park - September 27, 2015 ~ The History Girl! Travel back in time and experience the life of the Founding Fathers during “Market & Muster Day” at Washington Crossing Historic Park (PA) – Sunday, September 27 from 10:00 am - 4:00 pm. Witness Revolutionary War era townspeople gather at their colonial marketplace and soldiers assemble to drill 18th-century military tactics. While the soldiers march and fire their muskets, historic crafters will demonstrate and sell their wares. Families will enjoy a wide array of activities including crafts, hayrides, music and performances by Levram the Great, an 18th-century magician who is the official “Colonial Conjurer” of Historic Philadelphia. Visitors can also shop at the park’s modern gift shop to buy a variety of local crafts, art, and other goods. Admission to Market & Muster Day is $8 for adults, $4 for children age five to 11, and free for those under five. For $3 more per adult, receive admission to Thompson-Neely House and Bowman’s Hill Tower (no extra charge for children under 11). This is a rain or shine event.